SKY MAP: Mars as seen at 9 p.m local time on Dec. 18 from mid-northern latitudes. Mars will becloser to Earth this month than any time until the year 2016. The red planet is now the brightest "star"in the evening sky and is already above the horizon as evening twilight fades away.But give it at least two more hours – until about 8 p.m. – for it to climbabove the poor atmospheric seeing that's near the horizon. By then, thisbrilliant yellow-orange world will be at an altitude of around 30 degrees asseen from mid-northern latitudes. Your clenchedfist held at arm's length is roughly equal to 10 degrees, so by 8 p.m. Marswill be about "three-fists" up from the east-northeast horizon. Marsappears much sharper and steadier when it crosses the southern meridian, abouta half hour after local midnight. Its altitude as seen from most mid-northernlatitudes is then about 75-degrees (more than "seven fists" up fromthe southern horizon). 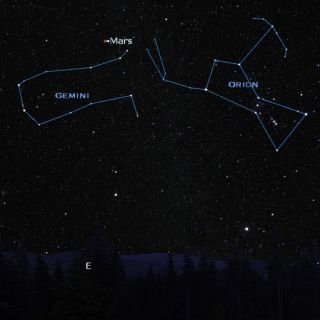 Mars is retrograding(moving westward) through the stars of Gemini and will cross over into Tauruson Dec. 30. It will come closest to the Earth on the night of Dec. 18 (around6:46 p.m. EST). The planet is then 54,783,381 miles (88,165,305 kilometers)from Earth. It is at opposition – exactly opposite from the sun, with Earth inthe middle – six days later, on Christmas Eve, Dec. 24. It willthen gleam at magnitude -1.6, and through Jan. 2, 2008, will outshine Sirius,the brightest star. Anyone who has a telescope,no matter how modest it may be, will surely be seeing what it can do with Marsright now. No doubt telescopic observers everywhere will be spying out Mars'bright polar areas and dark surface markings. So don't let your scope sit idle,even though the planet will appear small and details might be difficult todiscern on nights of less than excellent seeing. A good 4-inch telescope equipped with an eyepiece magnifying120-power should show Mars' dwindling north polar cap and at least a few darkfeatures on those nights when the atmosphere is steady. During January, Mars departs Earth's vicinity as rapidly asit arrived. It will increase its distance from 56.7 to 72.3 million miles (91.2to 116.3 million kilometers) and in the process will fade almost a fullmagnitude, from -1.5 to -0.6. But at the same time, Mars will be very wellplaced for convenient viewing. Unlike earlier in the fall, you won't have to get up in theearly morning hours to see it high in the sky. Mars will be due south justafter 11 p.m. on New Year's night, and around 8:45 p.m. at the end of January. The night that Mars will probably attract the most attention,from even those who don't normally look up at the sky, will be on the nightbefore Christmas Eve: Sunday, Dec. 23. That will be the night of a full moon,and Mars will serve as a companion to it all through that night. In fact, itwill result in an exceptionally close approach between the two across much ofthe United States, while for parts of the Pacific Northwest, southern andwestern Canada and Europe, the moon will actually occult (hide) Mars.